Happy 100th, Paramount! 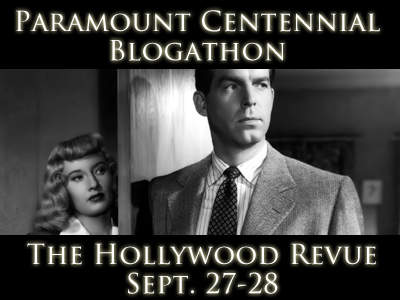 This post is part of the PARAMOUNT CENTENNIAL BLOGATHON, hosted by none other than The Hollywood Revue. The blogathon runs September 27-28, 2012. Fred MacMurray and Barbara Stanwyck discuss auto insurance. Rumour has it that once upon a time, when a North American woman wore an anklet, she was considered “loose”. Don’t ask us why. We are just as flummoxed as you. So when Fred MacMurray first meets Barbara Stanwyck in the 1944 film noir Double Indemnity, and notices that Stanwyck is wearing – gasp! – an anklet, audiences knew what that meant. An aklet meant Trouble. MacMurray has come to Stanwyck’s home to sell auto insurance to her husband, but really, who wants to talk insurance? He begins a flirtatious rapport with Stanwyck then, over the next few days, becomes smitten with her. By the time Stanwyck coaxes him into murdering her husband, he is powerless to refuse. As you might expect, being an insurance salesman is mighty handy when it comes to plotting a murder. MacMurray realizes there is a way to kill the husband and collect on a double indemnity clause in the life insurance policy. This is a clause that pays twice the usual amount when the death is caused by a really fluky accident. After the husband is disposed of, and the authorities declare the death accidental, the only pickle left in the jar is MacMurray’s co-worker, Edward G. Robinson. Robinson is an adjuster at the Pacific All-Risk Insurance company, who has an uncanny ability to sniff out phony insurance claims. And there’s something about Stanwyck’s claim that doesn’t sit well with him. Double Indemnity is arguably the most famous film noir ever made, and it’s just one of many extraordinary movies made by Paramount Pictures. The story, based on a novella written by James M. Cain, was sought by every Hollywood studio in the late 1930s. Paramount bought the rights in 1942, and created a film noir classic that was nominated for eleven Academy Awards. 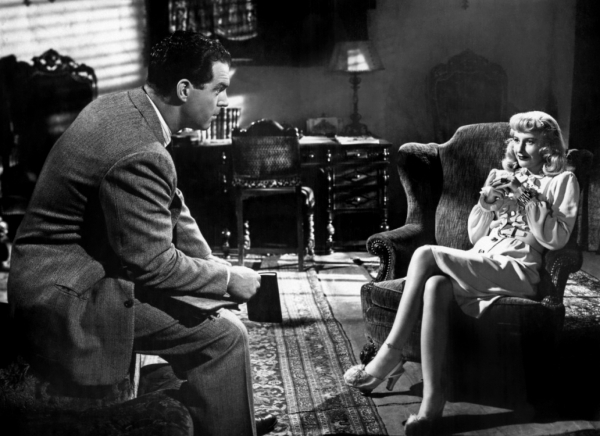 Double Indemnity is about murder, but it’s really a movie about relationships. This is rich considering the two screenwriters, Raymond Chandler and Billy Wilder (who also directed), hated working with each other. The relationship between MacMurray and Stanwyck drives the story, but it’s the relationship between MacMurray and Robinson that provides the soul. Robinson views MacMurray as a mischievious son; MacMurray is devoted to Robinson despite his surly exterior. Their relationship is symbolized in the lighting of matches; Robinson is forever patting his pockets in search of a light for his cigar, and MacMurray is forever providing the matches. But it is the last scene of the movie that shows us the depth of their friendship. In this scene, MacMurray is slumped in the doorway of the Pacific All-Risk Insurance Company. He’s been shot and is losing a lot of blood. Robinson, having just heard MacMurray’s detailed confession of murder, silently kneels beside him, his strained face lined with worry and utter disappointment. Robinson replies quietly, “Closer than that, Walter.” His words are sparse, but in those six syllables we see him baring his soul, like a father grieving for his only son. This time it is he who strikes a match to light MacMurray’s cigarette. Double Indemnity is one of those movies you can see time and again, and never tire of it. 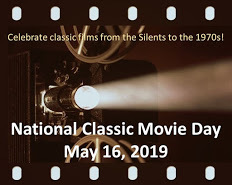 (We watch it at least once a year!) The script is water tight, the dialogue is sharp and sassy, and the cast has perfect chemistry. Not to mention it features one of the most famous anklets in movie history. Double Indemnity: starring Fred MacMurray, Barbara Stanwyck, Edward G. Robinson. Directed by Billy Wilder. Written by Billy Wilder and Raymond Chandler. Paramount Pictures, 1944, B&W 105 mins. Previous Lee J. Cobb: What a Character! One of the all time greatest movies and pure perfection from everyone involved. I think the reason girls don’t ware anklets very often these days is not due to any negative connotation, but rather that nobody will ever look as good in an anklet as the wonderful Barbara Stanwyck. A great post that brought a smile to my face! Ha ha! I think you’re right. Barbara set the bar way too high! You know, I’d never thought about the relationship between MacMurray and Robinson’s characters being the heart of the movie, but you’re so right! Yes, I wondered why the film paid so much attention to the anklet until I heard an interview discussing the changes in women’s clothing over the years. What a great movie! Barbra Stanwyck could really command the screen. No matter the movie, no matter the part, your eye is drawn to her. Wilder obviously realized this. Look at how he dressed her and the lighting. She glows in that room. Yet, in that pose and in that chair, she almost looks demure. Barbra Stanwyck demure. Wilder was a genius. Yes, in that scene Stanwyck does look demure – harmless, even! You’re right about Wilder. He truly was a genius. I love this movie. This and The Lady Eve made me a fan of Stanwyck. Isn’t she terrific? The Lady Eve is another fantastic movie. I love the scene where she’s scoping out Henry Fonda in her compact mirror. That’s a fun shot. I am still on the fence about which persona of Eve’s I like best, her normal one, her princess one or her socialite one. EG is just great in this film, but oh that anklet! It almost makes up for that wig! Ha ha! That wig is great, isn’t it? Double Indemnity is a great movie. The main actors are amazing, and Edward G. Robinson too. It has something Hitchcockian in it, no? The first time I saw this movie, I liked everything about it except for MacMurray, whom I thought was too stiff, but that changed for me after repeat viewings. It is a great movie, and Stanwyck is one of the great femme fatales of movies. I’m glad you also brought out the relationship between MacMurray and Robinson, because that’s another thing you catch upon rewatching it. It’s no wonder James Cain called this his favorite adaptation of all of his works. I never knew that about anklets. Aside from this movie, the only movie I remember where an anklet features prominently is “Dead Again”, and it doesn’t have any negative connotations there. I think the chemistry between MacMurray and Robison is my favourite part of the movie. MacMurray can seem a bit stiff when you first see the movie. Rumour has it he didn’t feel he was right for the part; he felt more comfortable in romantic comedies. Great write-up on one of my all-time favorite films! Maybe the ‘loose’ connotation started because anklets were first worn by women in cultures that the U.S. regarded as more ‘savage’ or at least exotic? Just guessing. Your theory could be true – makes sense. This is one of my fave films, too. So much to love about it. Thanks for dropping by. Good idea, to make an annual viewing of this film. Double Indemnity will always be watchable! Yup, this movie never gets old for me. Thanks for visiting! Saw this one a few years back and was impressed. It was interesting seeing Fred MacMurray play a character other than Steve Douglas or the Absent-Minded Professor. I had never heard about wearing an anklet meaning a woman was ‘loose’. I know that Jean Harlow wore one most of the time and off set. I had a conversation about that recently with a friend who does photo colorizations after noticing Harlow had one on in every pic. A great contribution to the Paramount 100th Blogathon. One of their best vehicles in my opinion. Anket: I heard an interview with someone discussing women’s anklets and that only “improper” women wore them back in the day. But really, that’s carrying things a bit too far. People had nothing better to worry about than anklets? Sheesh! She did turn some heads, didn’t she? She’s amazing in everything she does, in my opinion. Great piece on a great film. I must admit I am another one who hadn’t noticed the anklet, or hadn’t remembered it if I did – but as a fan of both Stanwyck and Robinson I really like both of them in it. I found MacMurray rather stiff in the role, but I’ve seen him in other films since where I liked him so I might warm to him more in this when I see it again. I’m interested in your thoughts about the relationship between MacMurray and Robinson being central – there is so much more warmth in their friendship (I like the idea of it being a father/son relationship) than in the coldhearted central love affair.